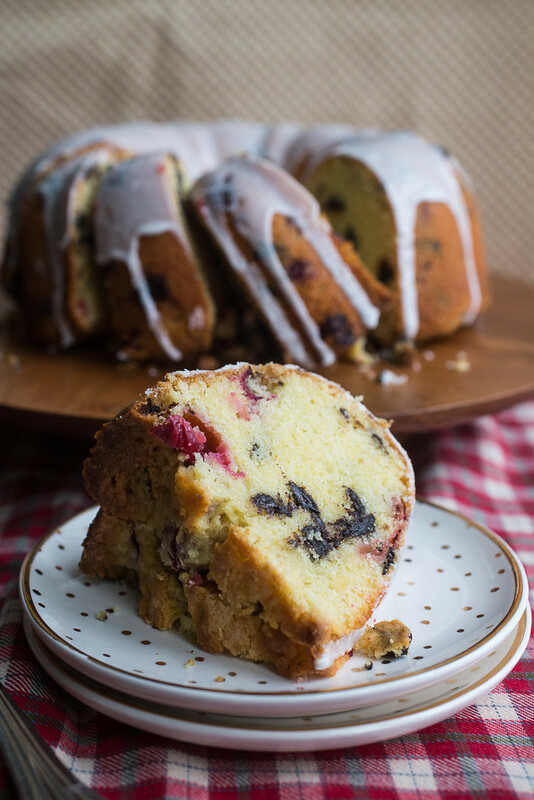 This orange cranberry chocolate chunk bundt cake is a fun and oh-so-simple to make alternative for your holiday dessert table. Or, your anytime table! Who’s with me on the gloriousness of a good bundt cake? I mean, it’s cake, and who doesn’t love cake? But there’s just something so comforting about bundt cake. Like, snuggle-up-under-a-blanket-with-coffee-and-cake comforting. It’s a low-maintenance type cake too – just dump the batter in the pan and bake. No fussing over layers and parchment rounds and frosting. Not that I don’t loooove frosting. 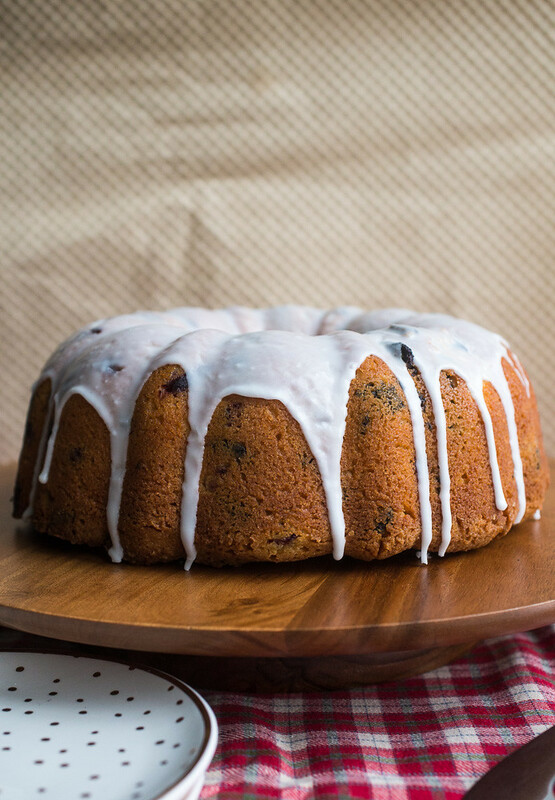 But picking at the crunchy top before you oh so graciously – with a wince and one eye snapped shut – flip the cake out of its pan onto a wire rack is quite possibly the best part of the whole cake. I made an orange chocolate chunk version EIGHT years ago (!!!) with the same level of enthusiasm but this cake is different. The fresh cranberries give a fresh pop of tartness that balances the sweet chocolate chunks in the best way possible. The recipe calls for 3 sticks of butter and 5 eggs which, at first glance, I thought was an error but I went with it…and to my surprise and delight, the cake was perfect (and it’s a BIG cake so the measurements work). Dense, buttery, sweet but also bright and refreshing. 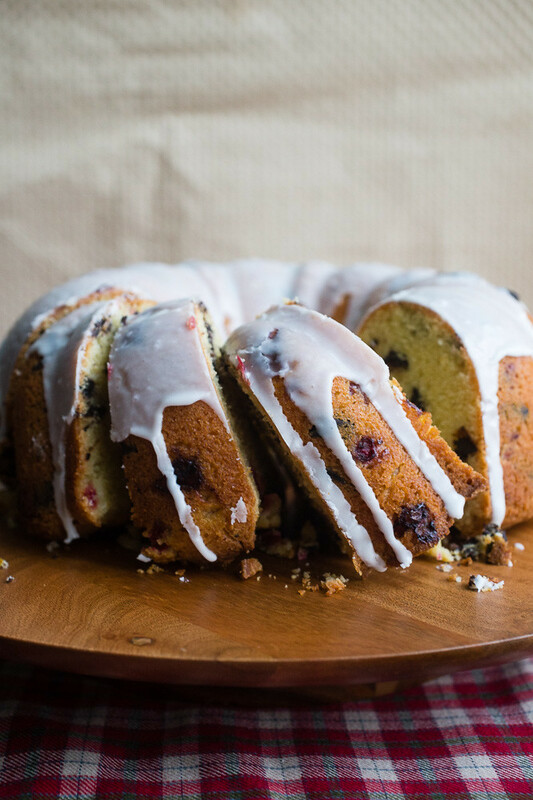 It’s a lovely cake and would be stellar addition to any holiday table. To make the cake: Preheat oven to 325° F. Spray a 10-inch bundt pan with baking spray; set aside. Whisk 3 cups of flour, baking powder, and salt together in a medium bowl; set aside. In a small bowl, work the orange zest into the sugar until fully incorporated; set aside. Beat the butter at medium speed in the bowl of a stand mixer fitted with the paddle attachment until creamy. Add the sugar-zest mixture and beat for 2-3 minutes at medium speed until light and fluffy. Add the eggs one at a time, beating well after each addition and scraping down the sides and bottom of the bowl as needed. Blend in the vanilla and liqueur. Add one-third of the flour mixture to the bowl and stir on low speed until just incorporated, then stir in the orange and lemon juices. Repeat with another third of the flour, then the heavy cream. Stir in the remainder of the flour and mix just until no streaks remain. Scrape down the sides and bottom of the bowl and give the mixer another spin for a couple of seconds just to combine everything. In the bowl you mixed the dry ingredients in, toss the cranberries and chocolate chunks with the remaining 2 teaspoons flour. Fold cranberries, chocolate chunks, and any residual flour into the cake batter. Transfer the batter to the prepared pan and level off the top. Bake for 60-75 minutes, until the top is golden brown and a long wooden skewer comes out with just a few crumbs clinging to it when inserted into the center of the cake. (Note: my dark pan needed the full amount of time. You may need more time for a lighter colored pan.) Transfer the pan to a wire rack to cool for 25 minutes. Flip the pan out onto a wire rack and cool completely. To make the glaze: Whisk all of the glaze ingredients together in a medium bowl until smooth. To assemble: Place a large piece of parchment paper or foil under the cake (keep it on the rack). Pour the glaze evenly over the cake so it drips down the sides and interior hole. Allow the glaze to set for 20 minutes before slicing and serving. Cake will keep, covered or wrapped tightly, at room temperature for 3-4 days. The cake is better on the second day after the flavors have a had a chance to mingle so any leftovers will be delicious. Looks delicious! Question- I love your blog but I had stopped following, Because on Feedly every single picture you post through Flickr comes through as a new blog post. I want to keep following but it floods my inbox and I’m guessing it’s a problem for others as well. Is there a way you can fix this? It doesn’t happen with any other blogs I follow and I believe most use Flickr. Hi Jacqueline! Thank you so much for reaching out with feedback. I actually had no idea this was happening as I follow myself on Feedly (ironically, to ensure posts look right after they are published) and I never saw that happen. I would have stopped following too if I saw that happening with a blog I followed – how incredibly annoying! I just found the setting I think was causing the issue and deactivated it. Please let me know if you continue to see this issue in the future and I’ll look further into it.